As Sara Ali Khan's Bollywood debut Kedarnath continues to rake in box office crores, the 25-year-old actress shared a thank you note for the warmth and appreciation she has been welcomed in Bollywood with. Sara, who plays the role of Mukku - a Hindu priest's daughter in the film - shared two behind-the-scene photos from the film's set to write this: "Thank you everybody for welcoming and appreciating Mukku with so much love. I'm already missing all those beautiful moments in Kedarnath but all it takes is a look in the mirror to catch glimpse of Mukku and to know she will always have an extremely special place in my heart and memory." Sara Ali Khan co-stars with Sushant Singh Rajput in Kedarnath. In her post, Sara singled out director Abhishek Kapoor for helping her become a better actress, Sushant for being a rock-solid support and also screenwriter Kanika Dhillon: "Thank you Kanika Dhillon for creating her, Abhishek Kapoor for nurturing her and Sushant Singh Rajput for consistently being there for her," read her note. As per Taran Adarsh's evaluation, Kedarnath is currently basking the glory of Rs 32 crore (four day collection figures) and have "passed the crucial Monday test" with over Rs 4 crore. The film, however, has not released in Uttarakhand after being accused of promoting "love-jihad". Kedarnath is a powerful love story of Mukku and Mansoor (a Muslim porter) set against the backdrop of the devastating Kedarnath floods of 2013. Directed by Abhishek Kapoor, Kedarnath may have opened to middling reviews but both Sara and Sushant have been received critical acclaim for their performances. 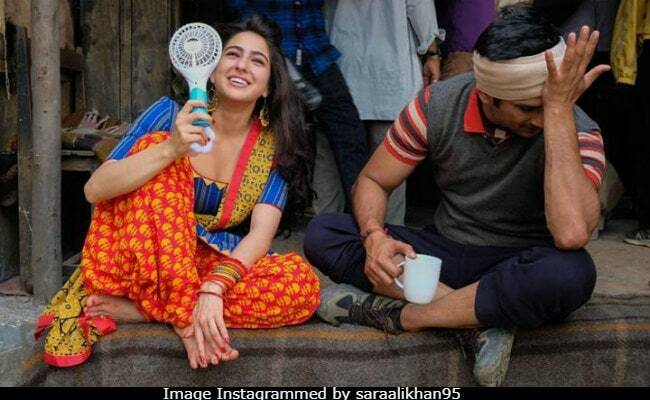 In his review for NDTV, critic Saibal Chatterjee said Sara has claimed much of Sushant's limelight: "While Sushant Singh Rajput does much of the heavy lifting with a great deal of flair in the course of the film, the biggest asset of Kedarnath is Sara Ali Khan, as self-assured a debutante as any we have seen in recent years. The actress may have got here because of the family she was born into, but nothing that she does in Kedarnath would suggest that she undeserving of this opportunity. She frequently steals Rajput's thunder, especially in the more intense sequences. She is confident, measured and convincing." Sara Ali Khan is now prepping for her second Bollywood film Simmba, in which she co-stars with Ranveer Singh. The Rohit Shetty-directorial hits screens on December 28.